John Flucke's Blog - Ramblings of Dentistry's Technology Evangelist: Could "Tooth Sensors" Help Provide Info to Improve Life? 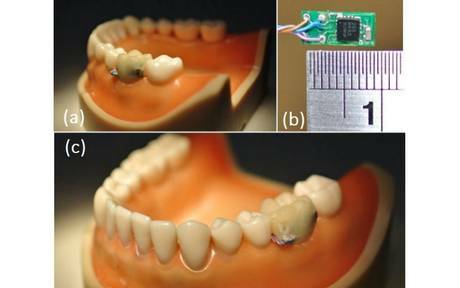 Could "Tooth Sensors" Help Provide Info to Improve Life? Here's an interesting look at some technology that just might provide researchers or government agencies info on health & lifestyles. It seems that researchers at the National Taiwan University in Taipei, came up with the idea of using a sensor system to monitor the habits of individuals. Accelerometers are the chips in our mobile phones that orient the phone in 3 dimensions. It's the device that knows when you turn your phone sideways to flip the screen image with it. The chip basically (as the name indicates) monitors the acceleration/deceleration of what it is attached to. The researchers at National Taiwan University had the pretty ingenious idea of attaching one of these to a molar (pictured above on a manikin mouth) and then letting the device collect data. It turns out that the mouth moves in certain ways when we are eating, drinking, coughing, etc and that the motion data collected can let researchers figure out which is which. In this way they can monitor how much of each activity an individual is doing. Of course it's also a bit big brotherish. I mean do you really want someone knowing how often you eat, drink, cough, etc? Definitely some issues in that regard would need to be worked through. A good article with lots of details is available over at Foxnews.com. Check it out!